Huami has been around for a while. The company manufactures the Mi Band series for Xiaomi and has its own Amazfit series of smartwatches and fitness bands. Last month, Huami forayed into the Indian market with its Amazfit Bip and Amazfit Stratos smartwatches. The latter is what we have over with us and we shall be taking an in-depth look at it today. Here is our Amazfit Stratos Review. Amazfit Stratos is primarily a fitness tracker coming at a price point of Rs 15,999 and offers some unique and comprehensive features like extensive sports tracking, step counting, continuous heart rate monitoring, Oxygen consumption tracking (VO2max), exercise load (TD) and recovery time advisor (partnership with Firstbeat) for those who run and do extensive exercises and many more. Also, those looking for classic round watch look should find it pleasing compared to the square and rectangular looks of most other Fitness trackers available in the market. I have tried Stratos for over a week in parallel with Fitbit Ionic. I believe this gives me a better understanding as I have been using Fitbit for over six years. That said, I won’t exactly be comparing Amazfit with Fitbit, but the old stats should give me a better idea. Note: Before I started using the Stratos, I changed a few settings. I had to turn on the Backlight settings and enable continuous HR. For me, these two are very important settings and I had them enabled not just while working out, but throughout the day and even while sleeping. Getting impressed with a smartwatch is one puzzle not every OEM can solve, but Huami has actually made a good looking watch which will appeal to many. Even though they are not the first, but there is not much competition in India. Stratos design speaks for itself in and out. It’s a circular watch with three buttons on the right. It’s built using ceramic bezel which houses the scratch-resistant 2.5D Corning Gorilla Glass-covered screen, buttons are made using stainless steel and the rugged carbon fiber design case makes sure that the watch can sustain accidental hits. The watch uses 22mm durable silicone watch straps. They can be detached and replaced with ease. Do note that the watch body is heavy (70gms), and be very careful when taking off your wrist. Chances of you dropping it on the floor are high if you are not careful. AmazFit uses always-on transflective color LCD touch screen to brighten up the screen. It is a form of LCD that allows sunlight to pass through and bounce back to improve visibility in daylight. This means the better the light outside, the better the screen display looks. This helps in extending the battery life, especially when you are outside. And it works. The display was absolutely fantastic in daylight or wherever the light was in abundance. None of the trackers I had used come close to the kind of display it offers. Sadly, this also means if you are in a little dark surrounding, it becomes little difficult to look what’s on the watch screen. While it offers backlight, it is not enough with its default settings. The watch allows you to set Auto Backlight on for a particular set of a time period which finally helped me during low light. The option is turned off by default. Turn it on right away if you have it or do it when you get it. The buttons on Stratos aren’t just for show. You need to use them while navigating through the watch interface. The top left button with red trimming is the power button. It is usually used to unlock the screen and navigate backward. The button in the center is either to select an option or a long press takes you back to the watch face. The last button navigates forward. If you are wondering why not just use the touchscreen instead? There are two reasons. First, the buttons are more intuitive to use, and once you are used to it, you would hardly use the touch unless absolutely necessary. Second, the touch is not really perfect on Stratos. There are hits and misses when using it, thanks to the unintuitive UI. So stick to using buttons. I have noticed that the hits and misses are mostly because there is so much data on the display. It becomes difficult to select at times, and if you accidentally swipe, it becomes confusing. 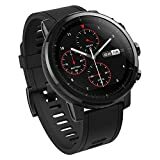 Amazfit Stratos is a multi-sport watch which can track running, walking, cycling, swimming, elliptical machine, mountain climbing and hiking, trail running, triathlon, tennis, soccer, and skiing. Its partnership with FirstBeat brings in the tracking of Vo2Max, exercise load, and recovery time which is important for those who want to train. If you are looking for a Smartwatch + Fitness Tracker which offers granular details on your workout, prepared to be amazed. The full screen displays a lot of data (can be configured) at one glance. You can look at steps, HR, distance, mileage, calories, and cadence. Swipe left, and you can see even more along with your GPS tracked path. Now let’s talk about how accurate Stratos was during workouts. I walk and run every day with GPS, and it went at par with Fitbit. There was a bit of difference, but that’s fine because I could see the ‘same difference’ (ha!) every day. Note: None of the trackers can claim they are accurate. So you need to follow this thumb rule. If the error is consistent, it still works. The only placed where Stratos missed tracking was when I wasn’t using GPS. This includes regular step tracking, and it wasn’t able to automatically track run or walk as well. Amazfit Stratos could track sleep, but it wasn’t accurate. I sometimes suffer from sleep apnea, and fairly know my deep sleep duration. The Resting BMP or resting heartbeat wasn’t accurate as well. I had compared this with a friend of mine, and depending on my age, weight, and other factors, it was way too high. The AmazFit App is so basic that you can call it as a data viewer. Anything you want to change on the watch is through the watch settings itself including the option to change step goal, connecting to WiFi, and so on. If I compare this with Fitbit, it has a more balanced approach where you can change many of the things on the App and then sync back. It’s one feature I truly loved about this device. You can manually or automatically upload your stats over to your account over WiFi. If you are wondering where it helps, many a time, when syncing data with Fitbit App, I have seen sync issues. This option, especially auto upload makes sure you will never face this kind of problem. Amazfit Stratos comes preloaded with a watch face that you can change from the watch settings. You get to see a preview as well. If you are choosing a classic watch face, turn on the second hand which will bring it one step closer to the real watch! The watch supports notification from all the apps, and you can read almost all the details which are useful. Most of the smartwatches and fitness trackers don’t support full details. However, when multiple notifications arrive from the same app, Stratos clubs them together, and you can’t read them individually. Stratos supports music i.e. you can upload songs from the app into the watch and then listen to music over Bluetooth earphones. It also incorporates a compass which comes in handy when out for tracking. If you are a professional runner, AmazFit Stratos offers Training center which can help you get better. Based on your choice (beginner or professional) it will ask you to work out every day, followed by a rest period to recover. When using GPS based workout, it takes around 5 to 10 seconds to find a lock. You can also export your workout to third-party services like Strava. However, Amazfit app does a decent job on the granular details of your stats, offering a breakdown of each type of workout you achieved. The settings I had used for the watch, keeping workout on priority, the battery only lasted for 2-2.5 days on an average. The charging cradle that comes in the package with the Stratos takes at least 1.5 hours to charge from 20% to 100%. This is a bit disappointing for those who workout every day. You will have to make sure to charge it before you go to sleep, else you won’t be able to track your sleep. I am guessing for casual usage, this will last a little longer and 4 days is my best guess. Should you buy AmazFit Stratos? As you can see, I’ve tried my level best to go through all the features it offers, and the pros and the cons. Keeping in mind the price, looks, and fitness features it offers, I would definitely recommend it. It’s tough to find a watch with the looks, and durability at this price point. The only thing you need to live with is its battery life to make sure you don’t miss tracking your daily workout. At Rs 15,999 in India (sells exclusively on Flipkart), it’s not “affordable”, but considering the competition, it’s pretty good value for money. Mind you, if you don’t care about the warranty and after-sale support, you can even import from sites like Gearbest for around Rs 11,000.